Very, very long ago, before there were so many people as now, two brothers were lost in a wide forest. They wandered on and on, not knowing where to go, and the elder often carried his little brother, when the child grew too tired to walk. Sometimes they gathered wild fruit, and sometimes they shot birds and roasted them. Day after day they plunged deeper into the forest, and night after night they slept in the branches. At last they saw an opening through the trees, and soon they were delighted to find themselves on the shore of a beautiful lake. The elder brother wandered about picking the hips from the Wild-Rose bushes, while the little brother sat on the beach, and amused himself by shooting arrows into the sand. One of the arrows happened to fall into the lake, and when the elder brother saw it floating away, he sprang into the water to get it, for he had only a few arrows left. The waves carried the arrow far from land, and the youth swam after it. But, just as he was about to grasp it, a canoe approached him, as swift as lightning. In it was an old man, who leaned over the side and seized the swimming youth. He dragged him into the canoe, which darted away across the lake. The little brother, on the beach, fell on his knees, and wept, and stretched out his hands; while the youth besought the old man with tears: "O my Grandfather, pray take my little brother, too! Do not leave him alone to die of grief and hunger!" But the old man only laughed a wicked laugh, "Ha! Ha! Ha!" and struck the canoe a blow, and it sped even more quickly over the water. Soon they approached an island in the centre of the lake. It was an Enchanted Island, the abode of the old man, who was Mishosha, the evil Magician. There he lived with his two daughters. And though he was the terror of all men, his daughters were lovely and gentle. He led the youth to his lodge, where his daughters were seated. "Rise up, my child," said he to the elder, "I have brought you a handsome husband." But the maiden drooped her lovely head, and said never a word. She and her sister rose up, and cooked the supper. And after they had all eaten, the youth lay down in a corner of the lodge to sleep. But soon he heard the two maidens whispering together, while their father slept. "Alas!" said the elder daughter, "our father has brought this young stranger, not to be my husband, but to kill him most cruelly! How long must we see such wickedness and do nothing!" And when the youth heard the elder maiden speak thus, he crept to her side. He told her how Mishosha had seized him, and left his little brother to die of grief and hunger. The maiden wept to hear this, and bade him rise up. "Go quickly," said she, "and take our father's magic canoe. Put food in it, and step in, and give it a blow. It will carry you to your little brother. Only return here before the Sun rises, and our father wakes." So the youth rose up, and hastened and loaded the canoe with food. Then he stepped in, and gave it a blow. Straightway it sped swiftly over the waves. In a short time he drew near the beach, and there lay the little brother, who had cried himself to sleep. The youth gave the child food, and told him to wait in patience, for soon he hoped to overcome the evil Magician. Then he would return to his little brother never to leave him again. So the child was comforted, and the youth, stepping into the canoe, gave it a blow, and it sped like lightning back to the Enchanted Island. When the Sun rose, Mishosha awoke, and said to the youth: "Come, my Son, I want you to go with me to gather Gulls' eggs. I know an island where there are many." So the youth, not knowing how to refuse, stepped into the canoe with the old man, who gave it a blow, and in an instant they were at the island. They found the shore covered with Gulls' eggs, while a flock of Gulls hung like a cloud over the island. "Go, my Son," said Mishosha, "and gather the eggs for me." The youth obeyed, but no sooner had he stepped ashore than Mishosha pushed the canoe far from land. "Listen, ye Gulls!" cried the evil one, "you have long expected a gift from me! I now give you this youth. Fly down, and devour him!" Then, striking his canoe, Mishosha darted away, laughing his wicked laugh, "Ha! Ha! Ha!" "Thus will I treat every bird that injures me! It is not for you, O Gulls, to eat human flesh! Nor is it in the power of that wicked Magician to give me to you. Take me at once on your backs, and carry me to his lodge." The Gulls obeyed. They drew close together so that the youth rested on their outstretched wings. And even before Mishosha could reach his home, they bore the youth quickly to the lodge on the enchanted Island. There they set him down, and flew away. The daughters were surprised and delighted to see him; but when Mishosha entered, he looked at him, and said never a word. When morning came, Mishosha said: "Come, my Son, I will take you to an island covered with beautiful pebbles shining like silver. I wish you to gather some for me." So once more the two entered the canoe, and the old man gave it a blow, and they were instantly at the island. He bade the youth go ashore, but no sooner had he done so than Mishosha pushed the canoe far from land. "Arise, King of Fishes!" the evil one cried, "you have long expected a gift from me! I give you this youth. Arise and eat him!" Then, striking his canoe, Mishosha darted away, laughing his wicked laugh, "Ha! Ha! Ha!" "Thus will I kill you! It is not for you, O Fish, to eat human flesh! Listen not to the words of the wicked one; he cannot give me to you. Take me on your back, and carry me at once to his lodge." The King of Fishes obeyed. He lifted his back from the water, and the youth seated himself, and held on by the fins. Quickly they sped through the waves. And even before Mishosha could reach his home, the Fish placed the youth on the shore of the Enchanted Island, and swam away. The daughters were surprised and delighted to see the youth; and when Mishosha entered, he looked at him, and said to himself: "What kind of a man is this whose power is so great! I must destroy him to-morrow!" 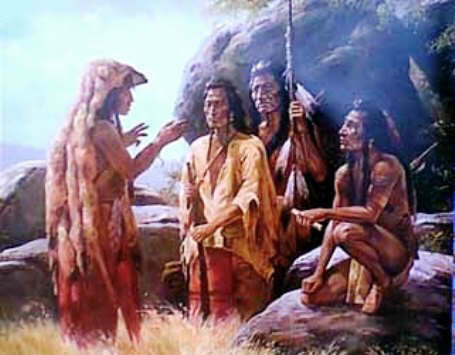 When the morning was come, Mishosha said: "Come, my Son, I wish you to get some young Eagles for me. I know an island where they dwell." So again the two entered the canoe, and the old man gave it a blow, and instantly they were at the island. This time he stepped out of the canoe, and led the youth to a tall Pine Tree. And in the topmost boughs were the Eagles' nests. "Now, my Son," said Mishosha, "climb up the tree, and bring down the young birds to me." The youth obeyed, climbing slowly, until he reached the nests. "Tree! Tree!" cried the evil one, "stretch yourself toward the clouds, and grow taller and taller!" And immediately the top of the Pine Tree stretched itself, and shot upward into the air, carrying the youth with it. "Listen, O Eagles!" then cried the old man, "you have long expected a gift from me! I give you this youth. Tear out his eyes!" Then, entering his canoe, Mishosha gave it a blow, and, as he darted away, he laughed his wicked laugh, "Ha! Ha! Ha!" The Eagles, uttering savage screams, circled around the youth, trying to tear out his eyes with their beaks and claws. But with his knife he cut off the head of the first bird that attacked him. "Thus will I do," cried he, "to every bird that injures me! It is not for you, O ravenous Eagles, to eat human flesh! Nor can Mishosha give me to you. Carry me back at once to his lodge." The Eagles obeyed. They clustered around him, forming a seat with their backs. Then they flew with him toward the Enchanted Island. And as they crossed the lake, they passed over Mishosha lying asleep in the bottom of his swiftly moving canoe. So they reached the Enchanted Island first, and, placing the youth on the shore, flew away. The daughters received him with joy, and when Mishosha entered, he looked at him, and thought: "Alas! Who is this, whose power is greater than mine! I cannot destroy him!" Now, when the morning was come, the youth said to Mishosha: "My Grandfather, I have gone on perilous errands with you. To-day I must ask you to go with me. I wish to try my skill in hunting. I know an island where there is plenty of game." The old man consented, for he thought in his heart, "I will destroy him while hunting." So together they entered the canoe, and the youth gave it a blow, and they were instantly at the island. They spent the day hunting, and when night came on, they set up a lodge of branches in the woods. Soon Mishosha was in deep slumber, and the youth arose. Now, the feet and legs were the only parts of Mishosha's body that were not guarded by evil spirits. So the youth took one of the Magician's leggings, and one of his moccasins, and threw them into the fire. Soon they were consumed. Then the youth lay down and slept. And while he dreamed, a great storm arose over the island. A piercing, icy wind began to blow, and sleet and snow covered the ground and bushes. And when they both woke in the morning, the deep snow was everywhere, and the cold wind was blowing. Then the youth got up, and called Mishosha to go hunting. But the old man could not find his legging and moccasin. With despair in his heart, he was forced to follow the youth, and he stumbled and crept through the snow that clutched his bare leg like an icy hand. Often the youth turned his head to see if Mishosha was following. He saw him falter, almost benumbed with the cold, but still he followed. Onward they went, hour after hour, through drifts and across ice-bound pools. At length they stepped from the woods, out upon the sandy shore. The youth then saw Mishosha stand still on the shore, for he could go no farther. The old man's legs grew stiff and fixed to the ground. But still he kept stretching out his arms, and swinging his body to and fro. Every moment a numbness crept through his limbs. His feet became roots in the earth, his legs grew together, and were covered with bark. The feathers on his head turned to leaves, and his arms to branches. And he was no longer Mishosha the Magician, but a tall and stiff Sugar-Maple tree, leaning toward the water. Then the youth rejoiced, and sprang into the magic canoe. He gave it a blow, and soon it was at the Enchanted Island. He told the daughters what had happened, and they were happy to be rid of their wicked father. They all entered the canoe, and swiftly it darted to the beach where the little brother was waiting. And then the elder daughter married the youth; and the four lived happily together in the forest.